Outstanding professors at SCICU’s 20 member colleges and universities were honored with Excellence In Teaching awards on April 9. The awards dinner kicked off the 2019 SC Independent Colleges and Universities Week. COLUMBIA, SC — Highlighting superior teaching, dynamic student advocacy, and visionary legislative leadership, South Carolina Independent Colleges and Universities Week demonstrated some of the finest qualities of independent higher education. As proclaimed by Gov. McMaster and memorialized in a concurrent resolution of the SC General Assembly, April 8-12 was designated Independent Colleges and Universities Week, with April 10 recognized as Independent Colleges and Universities Day at the South Carolina State House. The week kicked off with the 14th annual Excellence In Teaching awards dinner at the Columbia Convention Center. 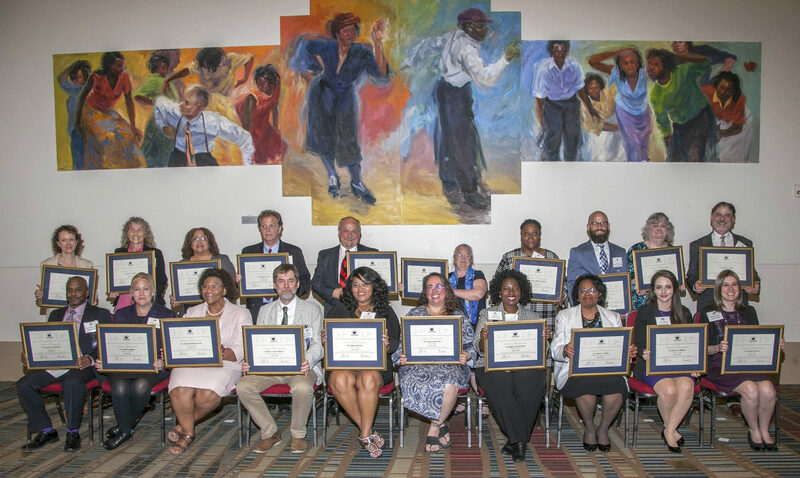 SCICU’s 20 member colleges and universities gathered on Tuesday, April 9 at the Columbia Metropolitan Convention Center for an evening commemorating the teaching achievements of outstanding professors. Each member college and university selected a leading faculty representative for the SCICU Excellence In Teaching award, with each recipient receiving a $3,000 award for professional development. Please visit scicu.org for a slide show featuring the 20 Excellence In Teaching award recipients. Click here to read more about the award recipients. A photo gallery of 2019 Excellence In Teaching award recipient photos is available here. Within hours after the conclusion of the Excellence In Teaching event, students from SCICU member colleges and universities traveled to Columbia for the annual State House Day on April 10. This rally represents the culmination of a student letter-writing campaign that resulted in members of the SC General Assembly receiving over 9,000 letters in support of the SC Tuition Grants Program, a new record. Please click here to see a gallery of photos from the 2019 Independent Colleges and Universities Day. Students gathered across from the State House for an early morning warm-up rally and visit with Sen. Vince Sheheen, SCICU’s 2019 Legislative Champion. Katie Harrison, executive director of the South Carolina Higher Education Tuition Grants Commission, presented students with an update on tuition grants numbers and projected funding. Following the warm-up rally, students visited with legislators and other public officials at the State House and in legislative offices. The day culminated with Speaker of the House Representative Jay Lucas recognizing SCICU college and university groups in the House gallery.